As the adoption of 4K Ultra HD video, emerging artificial intelligence (AI) applications and analytics drive the rapid growth and evolution of data in surveillance, Western Digital Corp. (NASDAQ: WDC) today unveiled the Western Digital® Purple microSD™ card, purpose-built for the complex and dynamic data demands of modern surveillance cameras and edge systems. Whether it's a business employing surveillance video to keep their assets secure or a retailer utilizing surveillance to accurately analyze shopping behavior through video facial recognition, capturing and assessing every moment is critical. Optimized for 24/7 surveillance video capture, surveillance system operators can count on the robust Western Digital Purple microSD card to support a continuous surveillance workload. With its outstanding performance, the card captures and preserves video in a variety of high-definition and next-generation formats, including 4K Ultra HD video, as well as nimbly supports the movement of data to core data systems for analytics and fast business insights. The rugged and humidity-resistant design of this new card enables trusted video capture in a wide range of environmental conditions, including outdoors in snowy winters and indoors in hot and humid factory settings. "From Big Data, to Fast Data, to data-centric applications such as surveillance, the volume, speed, variety and value of data continues to exponentially grow and transform. 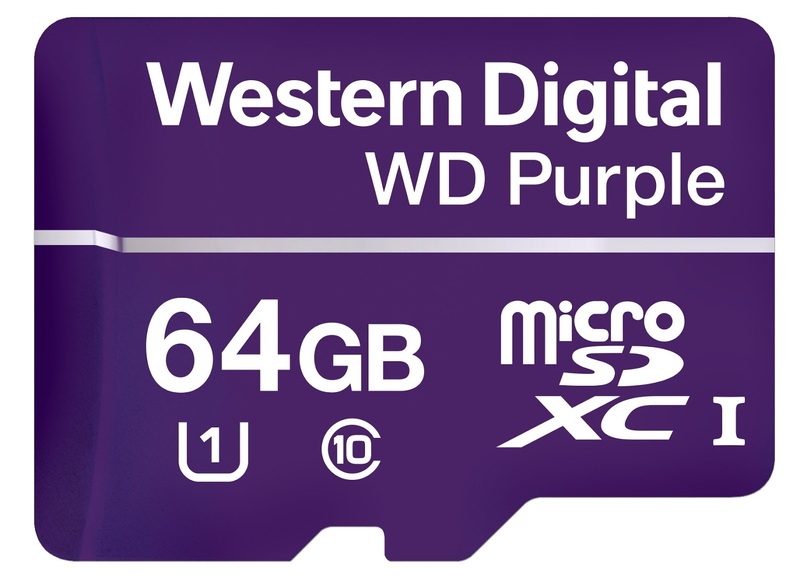 Leveraging our proven capabilities in consumer and industrial memory card innovation, the Western Digital Purple microSD card is the ideal solution for mainstream commercial surveillance data at the edge," said Christopher Bergey, Vice President of embedded and integrated solutions at Western Digital. "Whether capturing 4K video, used in AI-enabled cameras, or part of a larger data system supporting 'smart surveillance' applications, this rugged and intelligent card delivers 'surveillance-class' endurance and tremendous performance to enable trusted video capture in some of the harshest conditions. When combined with our popular Purple and Ultrastar hard disk drives (HDDs) to support data preservation and real-time analytics, Western Digital now provides the industry's most comprehensive offering for surveillance data, from the edge to the core." In compatible cameras, a unique health monitor offers reporting capabilities to provide users and system installers valuable information, including the card's endurance and capacity status, enabling predictive maintenance and taking the 'guess work' out of when to service the card. Designed for use in temperatures ranging from -25°C to 85°C, it enables reliable video capture indoors and outdoors. "Today's surveillance systems have moved beyond simple low-resolution video capture, to massive networks capturing 4K video and leveraging advanced new analytics software to unlock new business value from video recordings," said Michael Palma, IDC Research Director for Semiconductor and Enabling Technologies. "This has resulted in a surge in the volume and velocity of surveillance data at the edge and is creating demand for storage solutions that support the performance requirements of 4K video, 24/7 operation, and movement of video for smart insights." 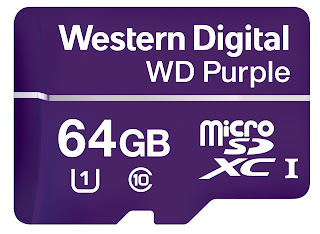 The new Western Digital Purple microSD card complements a full portfolio of data storage devices purpose-built for today's surveillance needs, including the Western Digital Purple Surveillance HDD for high-capacity support for NVRs and DVRs and the Ultrastar® HDD series for use in back-end servers performing surveillance analytics. Together, they provide surveillance system integrators and installers a complete solution to capture, preserve, access and transform surveillance data. Additionally, Western Digital offers original equipment manufacturers industrial-grade SanDisk® Industrial card storage solutions for use with cameras with in-camera analytics capabilities and a variety of connected surveillance applications. The new microSD card will be available worldwide through Western Digital's authorized reseller network in April in 32GB and 64GB capacities for $18.99 and $31.99 MSRP (in the U.S.) respectively; cards available in single and convenient 25-packs for surveillance system installers and integrators.